2007 – This year saw SkyPilot’s world premiere production of ROCKET MEN by Clyde Hayes, followed by productions of REQUIEM FOR A HEAVYWEIGHT by Rod Serling and TAKING SIDES by Ronald Harwood. 2008 – SkyPilot began their Children’s Outreach Program with a production of PETER COTTONTAIL, JR and finished the year with a mainstage production of DEATH AND THE MAIDEN by Ariel Dorfman. 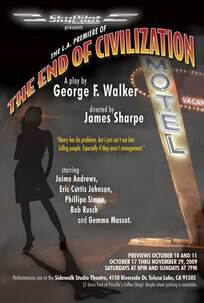 2009 – SkyPilot Theatre Company more than doubled it’s membership, thanks to the first ever general auditions and they finish the year with the LA premiere of END OF CIVILIZATION by George F. Walker. 2010 – Making a dramatic change and taking on a completely new direction, 2010 saw SkyPilot shift gears away from producing revivals and towards writing and producing only original plays as it’s mission statement. After a series of readings were held in the Spring, more new members were added that September, including new resident playwright Jeff Goode, who recruited nine more resident playwrights to come along for the ride. The Spring readings would become a monthly series of readings of new plays that continues to this day, with all plays cast, directed, and read by resident company members, serving as an evaluation of new and progressing work. 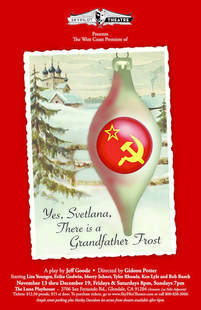 Jeff Goode’s play YES, SVETLANA, THERE IS A GRANDFATHER FROST was produced at the Luna Playhouse in Glendale in November to rave reviews. 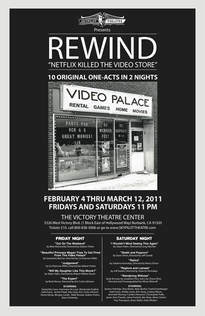 2011 – SkyPilot produced it’s first Late-Night Series with its World Premiere of REWIND in February, ten one-acts written by the SkyPilot resident playwrights, at the Victory Theatre in Burbank. Next, SkyPilot decided to move into T.U. Studios in North Hollywood for the rest of our 2011 season and opened Jeff Goode’s original work, THE EMANCIPATION OF ALABASTER MCGILL, in May to amazing reviews and audience reaction. SkyPilot followed with it’s next original production, TO THE NEW GIRL… by Samantha Macher, in August. This critically-acclaimed, all-female acted and directed show played to sold-out audiences and forced an extended run. SkyPilot closed out 2011 with the new play 4 MURDERS, by Brett Neveu, in October and November. 2012 – To kick off SkyPilot’s most ambitious season yet and what would become the biggest of it’s three years at T.U., the company produced it’s next night of one-acts for a January-February run, PLANE TALK, all set in various airports across the country. The addition of more new members saw the company grow to it’s biggest ensemble yet, prompting the production of several single-performance nights of workshopped one-acts that were performed mainly on Mondays through the first half of the year. 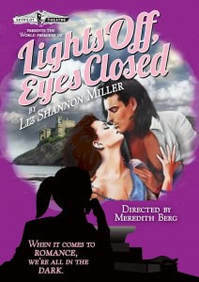 SkyPilot’s first of four full-length, mainstage productions for 2012 was Liz Shannon Miller’s romantic dramedy, LIGHTS OFF, EYES CLOSED. The show played to enthusiastic houses and garnered very good notices and led to SkyPilot’s next production, it’s first musical, the sci-fi themed EARTHBOUND: AN ELECTRONICA MUSICAL. Featuring three resident playwrights on book (Adam Hahn), score (Jonathan Price), and lyrics (Chana Wise), EARTHBOUND sold out it’s entire run through June and July, receiving rave reviews, including SkyPilot’s first PICK OF THE WEEK from the LA Weekly. More acclaim was to follow, with SkyPilot’s next production of Samantha Macher’s post-WWII drama, WAR BRIDE, which received universal raves and played to packed houses through the end of the summer. Closing out it’s biggest year saw the rise and fall of SkyPilot’s “biggest” character yet: KONG: A GODDAMN THIRTY-FOOT GORILLA. Written by Adam Hahn, this surreal, sideways look at the Merian C. Cooper character/legend played an extended run through October and November and continued SkyPilot’s streak of critical acclaim. The end of the year led to the formation of SkyPilot’s first Board of Directors. 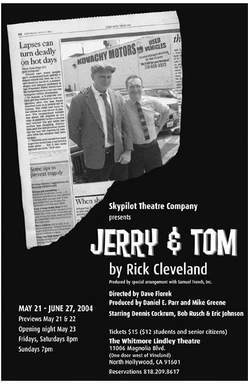 2013 – The first half of 2013 found SkyPilot throwing several succesful company fundraisers, featuring evenings of short plays written, directed, and performed by ensemble company members. The monthly reading series continued to develop new works, including SkyPilot’s first mainstage show of the year and it’s second musical, THE ISLAND. Reuniting the team of Jonathan Price (book and music) and Chana Wise (lyrics), THE ISLAND, a musical adaptation of William Shakespeare’s THE TEMPEST, found SkyPilot back at T.U. and played it’s summertime run to enthusiastic audiences. 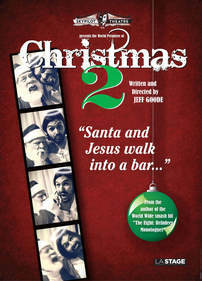 By the end of autumn, SkyPilot produced the biblical comedy CHRISTMAS 2, written by Jeff Goode. The show featured a double cast ensemble, ensuring singularly memorable performances each night, and played to packed houses and very good reviews. 2014 – The beginning of this new year was marked by another move. This time, to the NoHo Actors Studio on Lankershim Blvd, in the heart of the NoHo Arts District. To begin their ninth season, SkyPilot offered up TEN-MINUTE BENDERS, an evening of one-acts that ran for five weeks in the new space. Next up will be DETECTIVE PARTNER HERO VILLAIN, written by Brett Neveu, opening in April.